Are you planning to buy large amount of Bitcoins and you have no access to debit or credit cards? If your answer is yes, the best way to go about buying your crypto coin is by using your bank account. There are some incredible advantages to be enjoyed when you purchase bitcoin with your bank account. One of them is low transaction fees since there's little to no risk involved. Exchange services prefer bank transactions given the fact that unlike card transactions, most bank transfers are irreversible, thereby reducing the risk of chargebacks. So let's assume you purchase 1,000 dollars' worth of bitcoin on Coinbase with your bank account, you'll be charged an incredibly low fee of $14.99. Now compare that with buying with your credit card where you'll be charged $39.99 for the same transaction. It's quite obvious that using bank transfers saves you up to 50% on transaction fees. Another advantage you'll enjoy when you purchase bitcoin using your bank account is buying limit. Most exchange services have higher buying limits for bank transfers. This simply means that you can buy more BTC with bank transfers than you can buy with credit/debit cards. Nevertheless, you need to note that bank transfers are usually complex than card transactions. They also take longer processing time since the transaction needs to be cleared by many banks before it gets to the exchange. However, bank transfer is the wiser choice when purchasing Bitcoins as it will help you get the best exchange rate. We have compiled a short list of exchanges that accept bank transfers as payments for the purchase of BTC. However, you need to note that where you are in the world will determine the kind of exchange that will best suit your needs. Our list contains the most reputable exchange services that will allow you to buy BTC with your bank account on their platform. Without further ado, let's get down to it. We made mention of this exchange earlier in this post. Coinbase is practically the world's biggest bitcoin broker. As we noted earlier, bank transfers with bitcoin exchanges have a lot to do with where you are located in the world. For you to be able to purchase bitcoins from Coinbase with your bank account, you need to be either a US resident, or a Europe resident. For those in the United States, you can purchase bitcoin on Coinbase via ACH bank transfers, while those living in Europe can buy bitcoins through the SEPA transfer. ACH bank transactions take up to five days while SEPA transactions are usually completed within two days. You'll be charged a flat fee of 1.49% on all transactions. You may also be asked to add a MasterCard or Visa credit card as a backup and to unlock instant payments through bank transfers. Coinbase allows transactions with about twenty six different banks. They have high liquidity as they cannot run out of BTC, and the website's UI is quite intuitive for new users. Cons of using Coinbase include processing period of five days, and account monitoring. Coinbase monitor the funds of their users and they can take actions against your account if they consider your transactions to be illegal. Other exchange services you can buy bitcoin from while using your bank account in the United States include Bitstamp, BitPanda, Bitfinex, CEX.IO, and Kraken. As noted in option one, you can buy bitcoins with your bank account in Europe when you make use Coinbase. You'll have to be in the Eurozone so as to enjoy this benefit. You'll be charged the same fee as those transacting from the United States. Nonetheless, there are other exchanges you can make use of in Europe, including Kraken.com, and Bitstamp.com. These two are bound to offer you lower transaction fees especially if you are buying huge amount of BTC. Those residing in the UK can make use of Coinfloor.com. Transactions on this website can be done through online bank transfer or SEPA. However, you need to have a minimum deposit of one thousand pounds. Europeans can also make use of CEX.IO as they offer high liquidity and SEPA transfers. 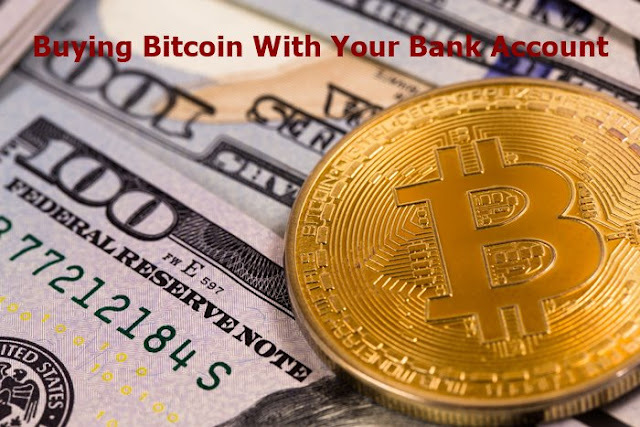 If you are not in Europe or residing in the United States, you can still buy bitcoins with your bank account as there are some international exchange services that will allow you to purchase bitcoins using your bank account. This transaction is usually done via SWIFT, better known as wire transfer. The most reputable exchanges include Kraken and Bitstamp. You can also use BTC-e although their reputation is questionable. Bitfinex is another good option but it takes some getting used to. A new user will find it very hard to navigate the website. No matter where you are in the world, you can easily purchase Bitcoin with your bank account. We have provided you with the right places to buy from, all you need to do now is buy your BTC. Have fun investing in cryptos! !